Create a new design by starting with a blank item. 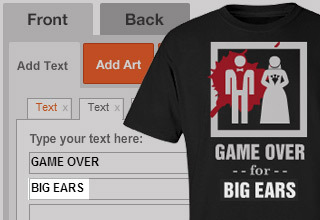 Shop our huge gallery of funny shirt* designs, choose one, and then customize it in our design center. 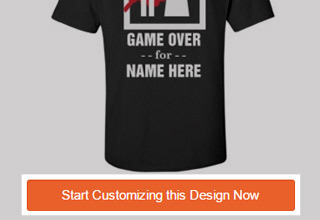 Sell your newly created designs through our storefront platform. *We say "shirts" but really we offer so much more: onesies, underwear, sweatshirts, tank tops, bags, hats, drinkware, and... actually just check out all of our items here. 1. Find a design you like. Hit the "Start Customizing" button. 2. Now you're in the design center. 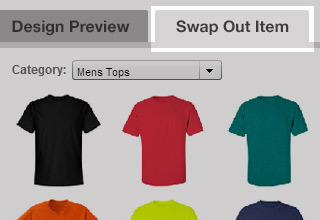 Hit the "Swap Out Item" tab to put this design on any other item. 3. Add your own text & art. Change the text. Change the colors. Move stuff around. Use art from our library. Upload your own image. Heck, you can even add metallic foil to some items.